To Be Calimquim » Blog Archive » The Storm has arrived – take cover! The Storm has arrived – take cover! 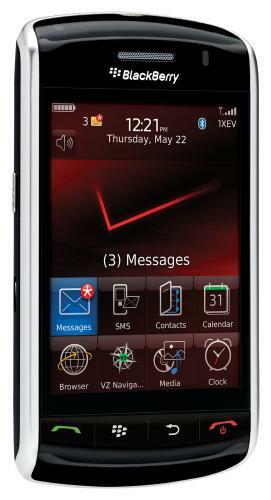 I just stopped by my local Verizon Wireless store to test out the Blackberry Storm and see what all they hype was about. Until now, I’ve been impressed with RIM’s newest smartphone offerings, but with the recent Storm release, I’d say RIM has taken a step backwards. Touchscreen is ridiculously laggy. There is too much delay between key presses. Basically, fast typists will become “hunt ‘n’ peckers” when using the Storm. Also, when using the touchscreen to select menu items, I consistently selected the wrong item. For those that didn’t know, the Storm touchscreen differs from the iPhone touchscreen in one major way – the Storm touchscreen is actually one BIG button. You physically can press the Storm touchscreen and hear a click. If you are interested in how this works, you can read this online article. Improved web browser? You could have fooled me. The Storm browser has only slightly improved from the one I use on my Pearl. I tried to browse some websites on the Storm and I always got the mobile versions of the web pages. Huh? Why aren’t the full versions of websites the default view? The iPhone’s Safari is still the best web browser on any mobile platform, although I can’t wait for the mobile version of my favorite web browser, Mozilla’s Firefox. Where are the Pro’s? Until I test out the Storm again, I’ll reserve the Pro’s judgement at a later date. I’ve read some of the online message boards and they say RIM is due to release an update for the Storm. That’s good and all, but why release an update so soon? In my opinion, RIM released this smartphone way before it’s time and should have worked the major kinks out. Of course, I’m sure they were pressured by Verizon Wireless and the upcoming Christmas shopping season. For those waiting to get a Storm of their own, I would suggest waiting until Version 2 comes out, probably next year. In the meantime, satisfy your touchscreen urges by getting an iPhone or iPod Touch. You’ll have a much more enjoyable experience.